CAMPAIGN AGAINST URANIUM MINING STEAMS ON! There are less than four months to go before uranium mines become legal in Queensland. 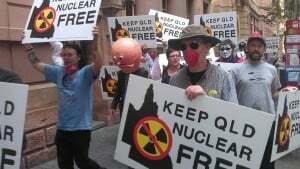 Premier Newman has broken his pre-election promise to retain the ban on uranium mining. 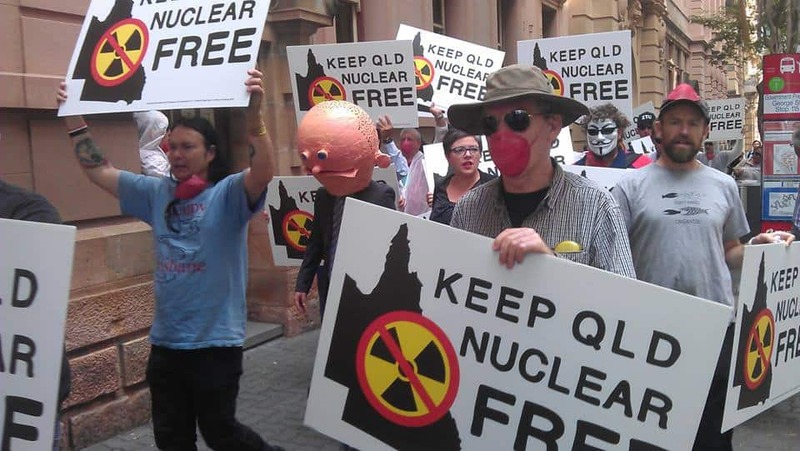 Keep Queensland Nuclear Free’s campaign is gathering momentum and is targeted on Townsville where 200,000 people live half an hour or less from the highest grade uranium deposit in Queensland in the Hervey Range at Ben Lomond. Since our campaign commenced just before Christmas, Shane Knuth, the Katter MP for Dalrymple has joined Labor and the Greens in publicly opposing a uranium mine at Ben Lomond. Meanwhile, local Newman government MP Sam Cox has been justifying uranium mining so close to his Thuringowa constituents. Good luck with that Sam! Our campaign has highlighted the dangers to local water catchments. There is a documented history of radioactive contamination in the 1980s at Keelbottom Creek in the Burdekin; there are also the obvious threats to the reef, tourism jobs and to residents near transportation routes. We’ve delivered 4000 leaflets into Townsville letterboxes along the Townsville Southern Ring Road and near the Port Road (which is the obvious transportation route to the port), we’ve made regular North Queensland media appearances on TV, radio and newspapers, appeared at the Cotters Markets and demonstrated outside John Hathaway MP’s Townsville office. We’ve also staged a range of protests and hi-viz wobble board actions to passing traffic to highlight the issue. A great worry for North and North West Queensland is that Prime Minister Abbott may well hand sole power to approve uranium mines to Premier Newman. We understand discussions have already commenced about doing exactly that as part of new environmental Bilateral agreements between the federal and state governments. The Newman government’s own so-called “Best Practice Framework” to recommence uranium mining does not in any way ban uranium exports across the Great Barrier Reef. In fact, it outlines a special process for Queensland ports to apply to the Coordinator General. This looks a lot like a fast track. Beware the fine print! The Port of Townsville says openly in its submission to the Newman government they “want to be the gateway to Queensland’s uranium mines”. The residents of Townsville and the Burdekin region have not been consulted about any of this and have received no information from local Newman government MPs Crisafulli, Hathaway, Cox and Menkins. Call Premier Newman’s office TODAY on 3719 7000 and tell them you don’t support dirty and dangerous uranium mining in Queensland. Urge him to re-instate the ban on uranium mining. Call your state MP’s office TODAY and tell them the same thing. With your support in this an election year, we can change this!